At first glance, cyclist appear to have been well catered for in the New Forest. Choosing my words carefully, there are quite a few purpose made cycle tracks around various areas of the National Park. For casual cycling round and round, going nowhere in particular, cycling just for the sake of it, these are perfectly fine and certainly are capable of producing some interesting rides. Upon closer inspection, particularly if one wants to get from A to B (or, in our case, from Sway/Brockenhurst to Bucklers Hard), it soon becomes clear that the various sets of tracks are not adequately linked. The cycle tracks do not form an interlinked network that readily get one from many As to many Bs. Someone should have studied the beautifully interlinked set of cycle tracks for the Châteaux à velo network near Blois in France. On one of the roads out of Brockenhurst, there is a glaring example of cyclists not being considered – in this case, being ignored completely. Some body, presumably Hampshire Council, though it could be a more local body, has seen fit to install several chicanes, so-called traffic calming measures. These chicanes constrict the width of the road to a single lane. Chez nous, such chicanery is almost invariably installed with due consideration to cyclists, namely a straight-through route, wide enough only for bicycles, on the near side, i.e. in the gutter. These bicycle “bypasses” enable cyclists to continue their journey unhindered without the need either to slam on their brakes or to swing out, in life-threatening fashion, into the main flow of what is general inconsiderate motorized traffic. (The highway equivalent of “sail before steam” appears to have been largely lost in good ol’ Grande Bretagne, these days.) Are there any bypass tracks for cyclists at these chicanes on the Brockenhurst road? Absolutely, not – not a single one. In the environs of Brockenhurst, cyclists must run the gauntlet by moving out and holding up impatient drivers approaching from the rear (the chicane is wide enough only for a single car) or occasionally be forced to stop their already difficult uphill progress in order to make way for an opposing car bulldozing its way through the chicane in the opposing direction. “Me, give way to anyone? Never!” Tourists are encuraged to rent bikes, here. Why no simple straight-through route in the gutter for bicycles, especially for these occasional (i.e. inexperienced) cyclists? Stone age man was well acquainted with the benefits of flint. Stone age man knew that flint was amazing stuff. By “knapping” flint, i.e. skilfully smashing it with another stone, slender razor sharp shards of flint could be produced. When such slender sharp shards were bound onto the tips of wooden shafts, spears and arrows were made capable of killing either a passing deer or even another stone age man. Flint produced some very useful ancient weaponry. Another genius, perhaps the same one that designed the cyclist-unfriendly chicanes around Brockenhurst, thought flint would be a good material to use to “pave” the not-quite-interlinked cycle tracks around the forest. Without question, flint is hard-wearing. Tons of flints are probably loaded onto lorries/trucks, then dumped from said trucks onto the forest tracks before being bulldozed (this time by a bona fide bulldozer rather than an impatient car driver) along the tracks to form a reasonably durable surface. This imagined sequence seems to produce at least three processes that might cause the flints to bang together: loading, unloading and bulldozing. They may not be intentionally or skillfully banged together as in knapping but the law of averages suggests that, eventually, some will bang together in such a way that, just by chance, a slender sharp shard resembling a stone age arrow head might be formed. Today, our legs had recovered from Bucklers Hard. 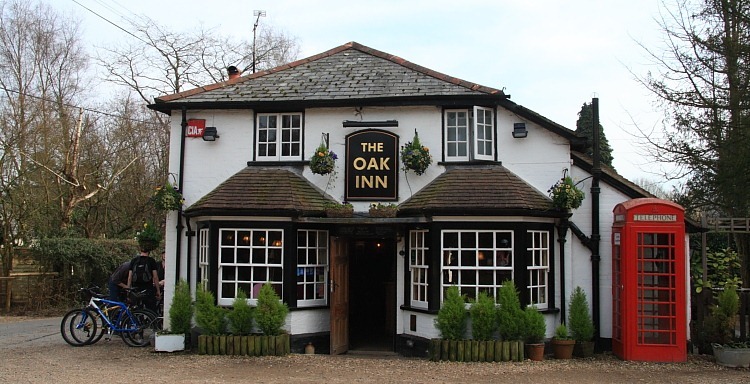 On yet another pleasant, sunny day in the New Forest, we decided to take a trip out on our bikes to a painfully cute pub at a village intriguingly called Bank. Francine did what she could to join together as many unlinked cycle tracks as possible and designed a route. One of the roads required to link together some of the disjoint tracks was the chicane-rich road to and from Brockenhurst. Battling a fearsome headwind, we survived the cyclist-unfriendly chicanes. Eventually, after 12 miles of a variety of surfaces, we arrived at Bank where the pub, mercifully, was still open for a pint of refreshment. My heart soared as I noticed a barrel of Gales HSB behind the bar. Marvellous, unpressurized beer straight from a tap driven into the barrel. No better way of serving the country’s finest beer. Suitably refreshed, we left the now closed pub to commence our return journey. Two other sets of cyclists arrived expecting refreshment. I informed them that the pub had stopped serving. Rule Britannia! We returned to our bikes only to discover that poor ol’ Franco’s bike’s rear tyre was as flat as a crêpe. Merde! Encore merde! I upended my bike, went through the mucky process of removing the rear wheel and started searching the tyre. “Ah, je le trouve!” The culprit? A slender sharp shard of flint that would have made any stone age man consider himself well armed. I had two puncture repair outfits. Sounds like a case of belt and braces. Rubber solution goes off in time and I had yet to replace either of these this season. The first tube of rubber solution was completely desiccated. Hopefully this was the older of the two. I tried the second kit and mercifully found liquid rubber solution. After a heart=stopping while or two, Franco was on the road again, albeit grubby from a pub-side emergency repair. Front wheels are so much easier. 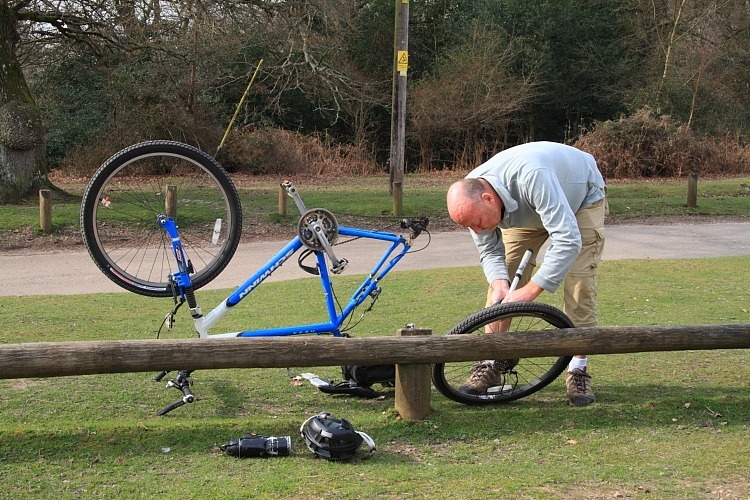 This is actually the second flint-induced puncture I’ve suffered in my New Forest cycling career. I’d like to meet the genius who thought flint was a suitable material where pneumatic tyres are prevalent and shake him or her warmly by the throat. Actually, I’d like to have a serious talk with whoever is responsible for bicycle planning in these parts.